Upon entering Summit Retreat, you’ll notice soaring ceilings of the great room, with the spectacular panoramic views of Lake Shasta just outside the wall of windows before you. You’ll notice the custom mosaic on the entry floor, sitting area with fireplace to the left, and ‘forward edge’ custom marble fireplace with carved amber lighting inset, accenting the great room. Next to the great room is the panoramic view dining area with built in fireplace. Adjacent is a full pub/bar area and fireplace reminiscent of the finest pubs in Napa Wine Country. Behind that is the commercial quality kitchen and yet still beyond that the game room. Opposite the dining area is a sitting area with expansive views toward the East and Mt. Lassen. The first story is completed by two bedrooms, each with their own fireplace. 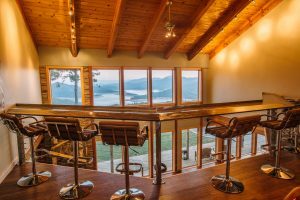 As you wind up the staircase, one enters the view balcony looking out the upper windows and experiences the incredible views of Lake Shasta and Sutter Buttes 135 miles away. To the left of the view balcony are the Horizon View and Sunrise Bedrooms and a shared blue slate bathroom. To the right is the Panoramic View Bedroom and Loft (with private bathroom), and the Shasta View Bedroom with private bathroom. The retreat itself boasts approx. 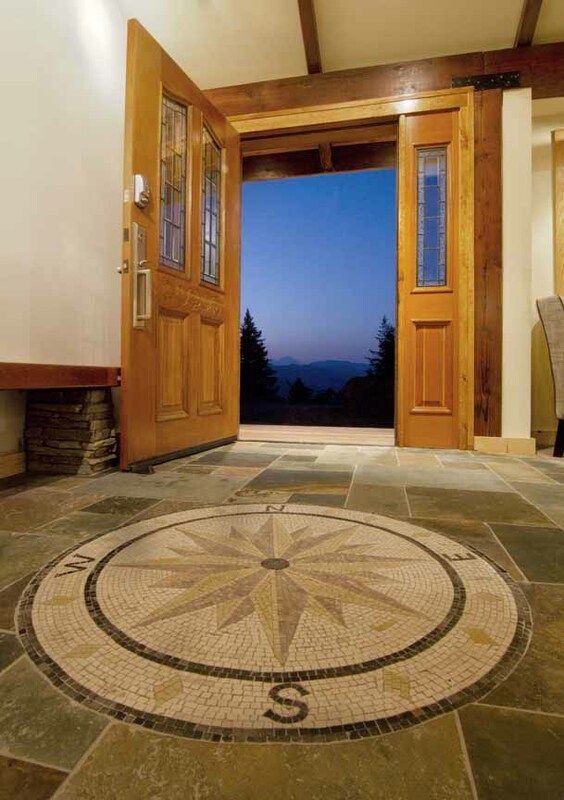 5,500 square feet, and is situated on 150 acres of private mountain top land that affords 300 degree lake views in all directions. It has 6 bedrooms plus a loft & can comfortably sleep 12 adults (in beds). Additionally, there are 6 bathrooms, a commercial grade kitchen, pub & game room; a pool and jacuzzi, detached spa room, 9 fireplaces, and unmatched panoramic views of Lake Shasta, Mt. Shasta and Mt. Lassen. Sleeps 3 with a California King and a Queen in the loft (limited living space thus one person recommended). Complete with an en-suite bathroom, custom shower, duel sink vanity & a fireplace. Sleeps 2 with a standard Queen. Complete with an en-suite bathroom, custom shower & a fireplace. Sleeps 1 with a Super Twin (48″x84″). Complete with a fireplace and it’s own vanity and sink (shares a bathroom with the Horizon View Bedroom). Sleeps 2 with an Eastern King. Complete with a fireplace, sitting area, and it’s own vanity and sink (shares a bathroom with the Sunrise View Bedroom). Sleeps 1 with a Super Twin (48″x84″). Shares a bathroom and shower with the River View Bedroom. Sleeps 2 with a standard Queen. Complete with a fireplace and it’s own vanity and sink (shares a bathroom and shower with the Aspen View Bedroom).